MoRita tries constantly to find ways to fix things in her home with absolutely no use of tools or skills. I've got two cats. One of them enjoys peeing on beds (he's healthy... he's just kind of a jerk), so I do not want the cats in my bedroom. However, my windowless bathroom is attached to my bedroom, which means when I take a shower, the humidity rises in my room. Or, in winter, the heat doesn't get into my room and the temperatures are sub-Arctic at night. I just want to leave the bedroom door open, darnit! I needed a pet gate, but let's face it, cats can jump over most of them. The really tall specialty ones cost a fortune. I could make one myself following some internet directions except that I have no tool skills whatsoever. I live in constant fear of removing my own finger accidentally with a screwdriver. I am a low-skill DIY (do it yourself) type of gal. So, I thought and thought and thought, and I finally came up with a great idea. Below, you will find directions for a freestanding cat/dog gate you can make of any height, using only scissors (and possibly a hammer if needed) as far as tools go. I will also include directions on how to attach the gate to your wall in a way that is easily removed (by you, not by the cats)in case you don't want the cat-gate look for a while. Attaching the gate to the wall is useful in case your cats are particularly stubborn or you have a very tall gate that needs stabilizing. Read on, my clever, cat-foiling friends! 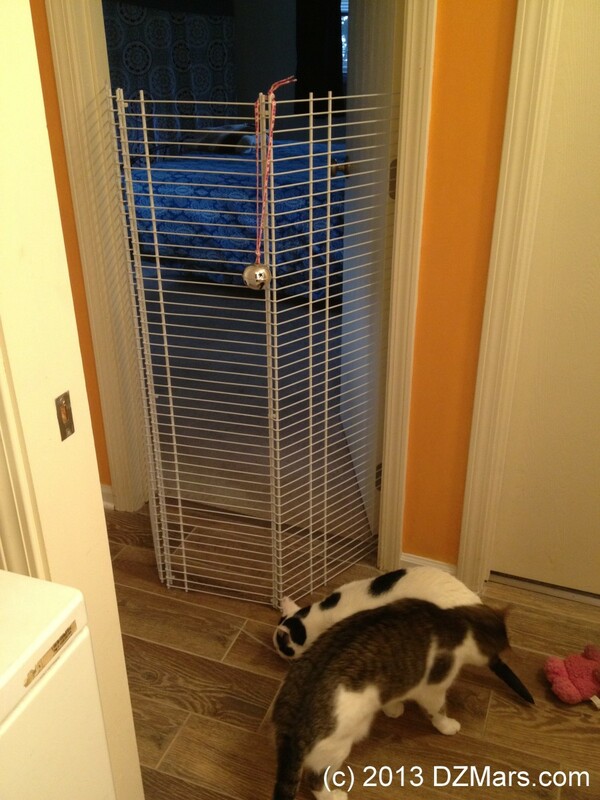 Foiled by the beautiful homemade cat gate! Three wire shelves; the length should be how tall you want the gate to stand. You can get them cut to size at Home Depot. Mine are a standard, pre-cut 4', preferably with a lip and no wider than an inch; 16" width. 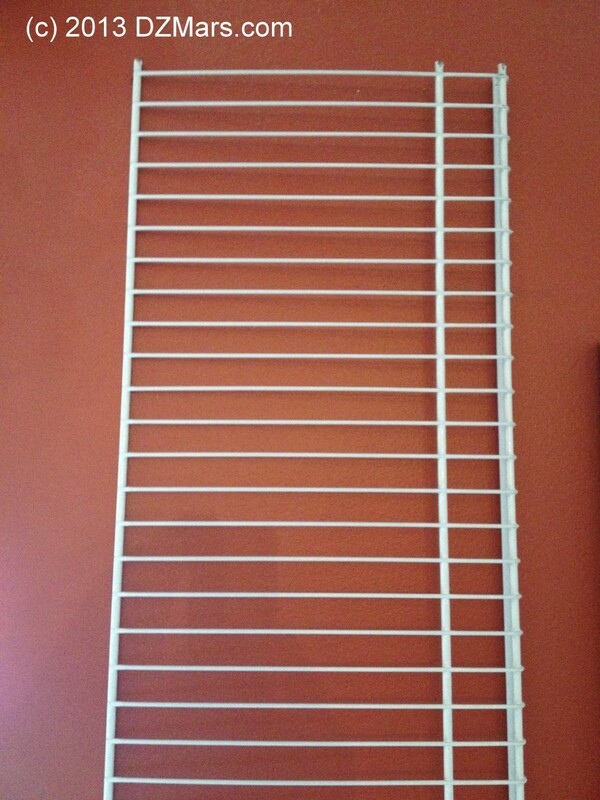 At most home improvement stores, such as Menard's or Home Depot, you can find wire shelving such as I have shown above. I got the 4' pre-cut ones. They were roughly $4.50 a piece at Home Depot. I think they were 16" wide. This would be the preferred width for this application. 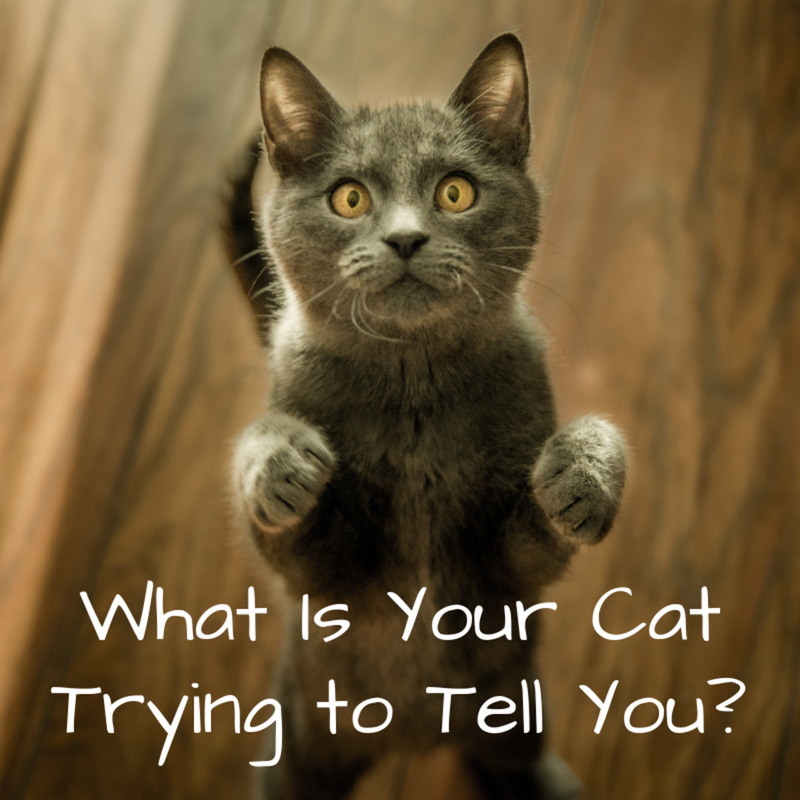 If your cats are climbers or high jumpers, you can get longer pieces of shelving. You will need to ask a sales associate to cut it to the height you'd like to use. 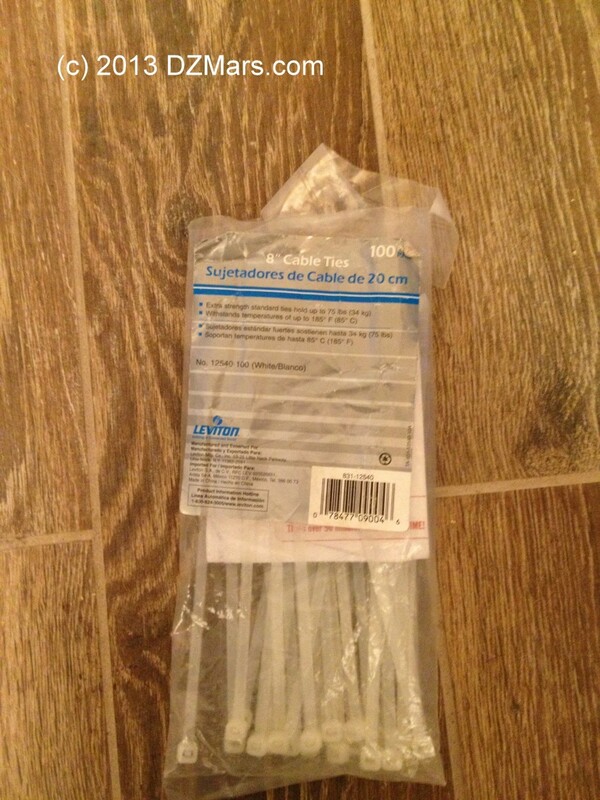 I got cable ties in a clear color, not the super-skinny ones, 100 lb. tested. They are pictured here to the right. Put two of the shelves together side-by-side the long way. Attach the long sides together at the very ends and middle using the cable ties. If there is a lip on the side you are attaching, attach the cable ties to the end of the lip. Tighten the cable ties until they are tight enough to hold the shelves together steadily, but loose enough to serve as a hinge. Clip off the leftover cable tie tails with the scissors. Next, attach the last shelf the same way. You should now have a 3-part hinged gate that will stand by itself. If you're making a free-standing gate, that's it. You're done! You can now wedge it in your doorway, and watch the cats try to ponder a million ways to get around it. There are several different ways you can jam it in your doorway to prevent the cats from opening it. I hung a large jingle bell at the top, so that I can hear the cats if they decide to try to get through it. 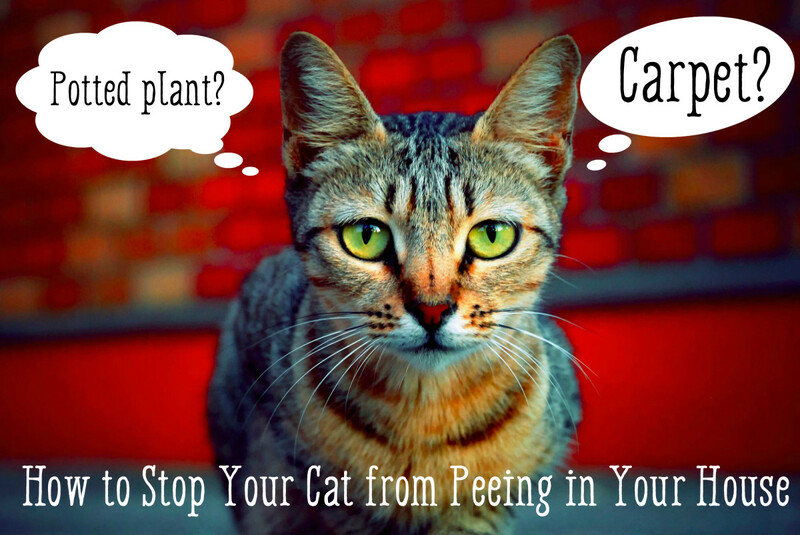 If your cats start jumping, climbing, or pulling on it, you will want to use hook and eye latches to keep the gate from falling on your pets and potentially hurting them. Read on for further directions! To attach your gate to the wall in a way that is easily removable, follow these steps. Open the gate so it is wider than the door and so the sides rest against the door frame or the wall, as pictured to the right. Figure out where to put the hook and eye along the shelf side. 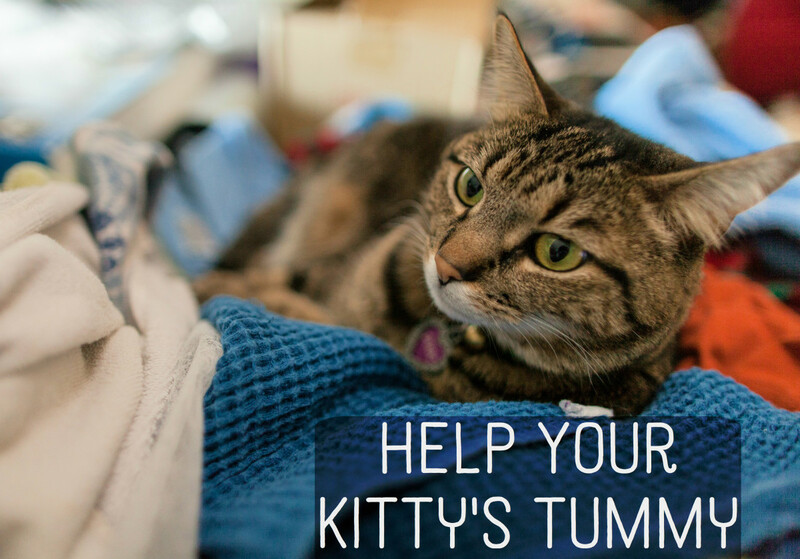 If your cat wants to pull at the bottom of the gate, put the hook and eye in the wall toward the bottom. If he tries to climb, put the hook and eye toward the middle or higher. Doing this will keep it from flipping / falling over and crushing the cat. You may want to put two hooks on each side for added safety. You could go up to three. Using the hammer and nail if needed, make a tiny hole in the wall to attach the hook part of the hook and eye. 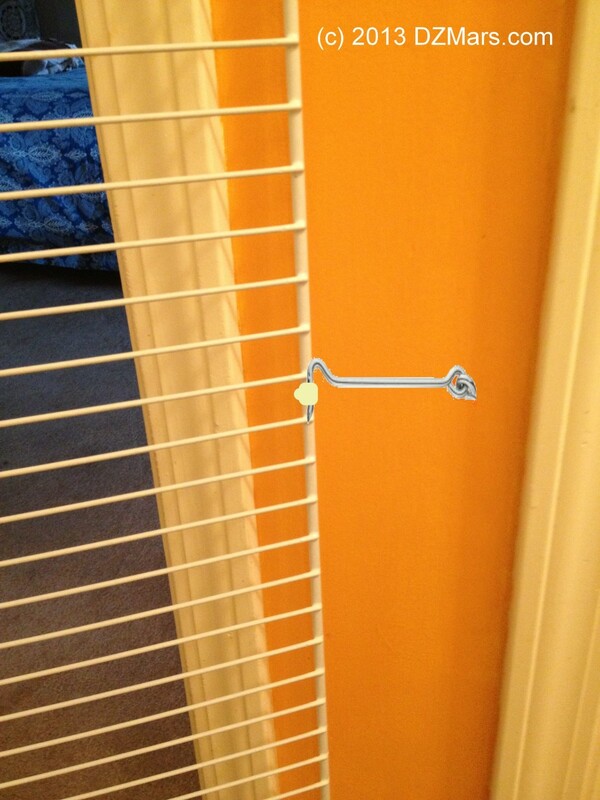 Screw the hook-holding part into the wall. You will not need the eye part. Put the hook so it it right next to edge of the shelf, as in the illustration. Take a cable tie and wrap it around the hook and the edge of the shelf, as pictured. Tighten snugly, but not too tightly. Cut off the end. You now have a loop in which you can place the hook to hold your gate against the wall. 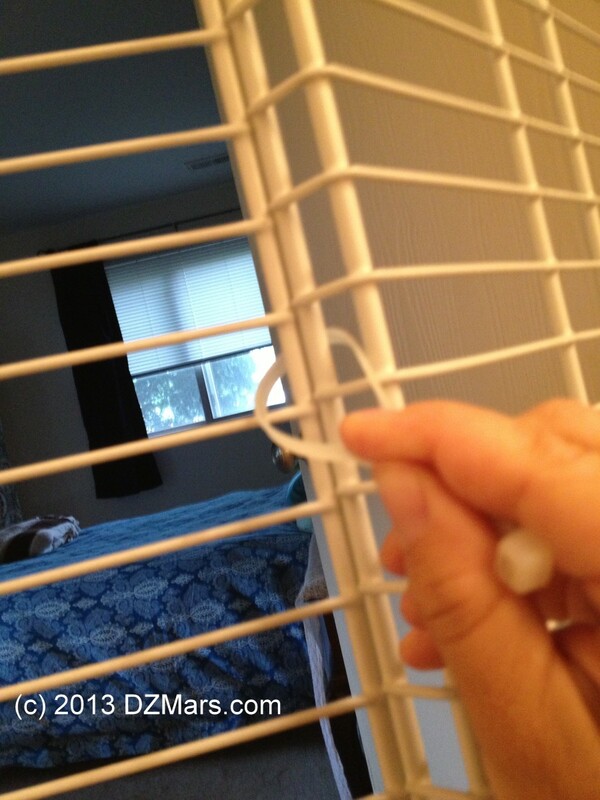 Lifting the hooks out of the cable tie loops will allow you to remove the gate. Okay. You're finished. I suggest using this gate when you're home, and monitoring your pets carefully. I cannot be held responsible if your cats pull this on top of themselves and tragedy strikes. Actually, I can't really be held responsible for anything that might happen from using this gate. This is simply what has worked for me. I've not needed to attach this to my wall, as my cats don't really bother it much. They're stubborn, but the few times they've tried to move it (pee-cat especially), the jingle bell has alerted me and I've gone after kitty with the scary water-bottle sprayer of terror. 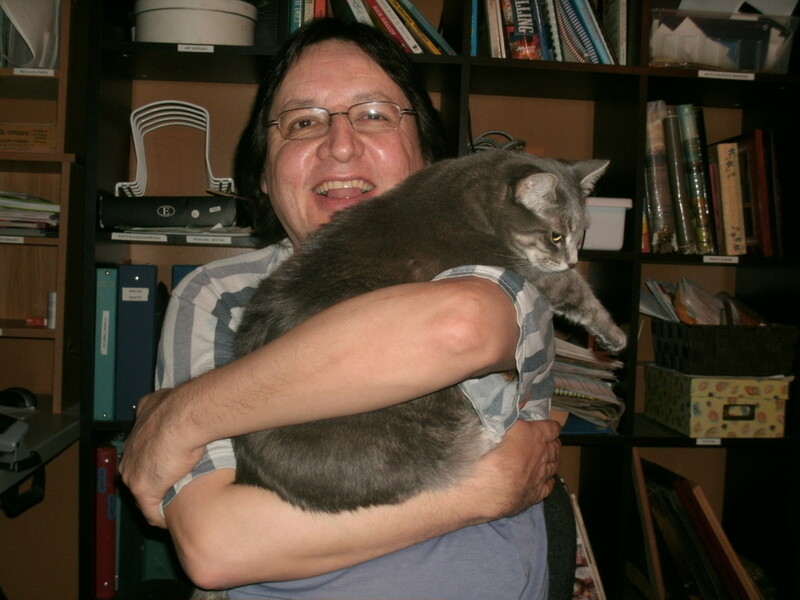 Now, the kitties' interest in it is gone, my bedroom is well-aired out, and life is good. Hope someone else can make good use of it as well! I used two shelves to create a gate at top of stairs. My 1 year old kitten can get over ANYTHING, even after I added aluminum foil. So my latest attempt is this: two shelves for gate then additional shelf for top to keep her from climbing. Will let you know how it works!! I signed up just now to tell you how brilliantly this worked. We are having a very hot summer in Melbourne and in the evenings when the weather breaks I have lovely big patio style doors to throw open to the sea breeze to cool the house down, only I wouldn’t because I was too worried that the cats would jump from the balcony. So we’ve been slowly baking and my partner was going to kill me because I wouldn’t let him open the doors. But I found your solution online and a quick trip to the DIY warehouse, 20 minutes assembly and less than 100 dollars Australian and it’s sorted. The cats love it too. They can listen to the magpies and smell the sea. It’s just lovely. Thank you for sharing this idea. I agree, this is genius! 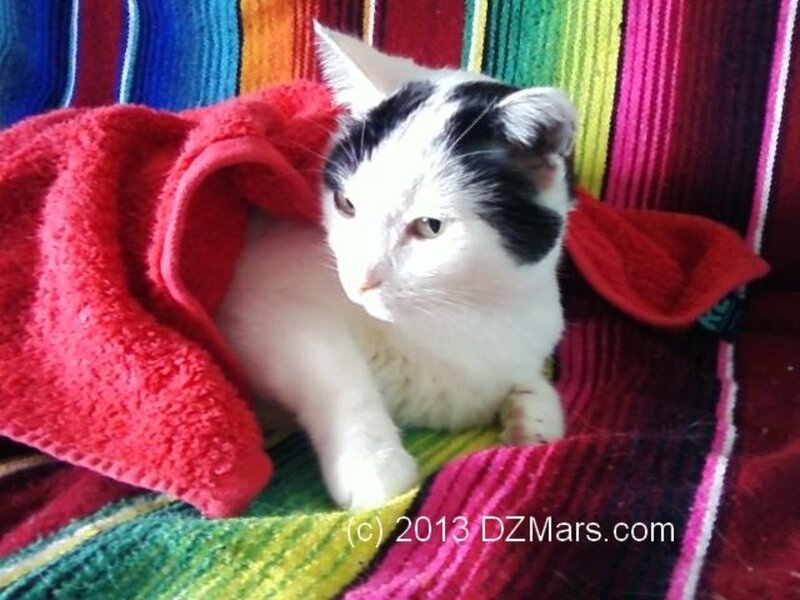 We have a 17 1/2 year old female and recently rescued a six year old male. He always wants to play but is way to rough for her. We have a very short, 42” wide hall way off our great room. A barrier here would be the perfect place to split our house when we are gone. Nothing we researched was tall enough not to mention the cost, until we saw this. Our male has no fear, is spry, rambunctious and has his claws so we were afraid if it was free standing he would try to climb it and possibly pull it over on himself and get hurt. There is no practical place to put hooks. We went to the other link and read how someone ran a tension rod through theirs. We zip tied three 16” x 6’ pieces together. When folded we put a tension rod through them about 5’ up and placed in the small hallway then spread out the pieces to zigzag across the opening. It is perfect! When up, we can swing the end piece to get to the other side and it is easily removed and stored in a closet. Grant total, less than $55! Thank you! Pure genius. Here I was looking at sonic gates, deterrent sprays, and all sorts of weird and expensive ways to keep my furry kids from going out the front door. This is so simple and inexpensive. I love it and it worked! Thank you! Sounds like a pretty wild cat, over there! :) I hope you find a solution! No, I get it! That's a great idea! Thanks for sharing and I'm glad it worked for you. One of my cats climbed over -- toilet paper rolls didn't deter him from the 6-ft climb. Up and over and down the other side as we watched -- should rename him "Ninja". Have put a sheet of aluminum foil across the open top for now while I try to decide whether or not to pursue buying the 8-ft shelves & having Home Depot cut them to the height of our doorway less an inch knowing once they are cut there's no returning. Also am intrigued by LotsaCats posting using two 16-inch shelves and spring tension rods... wish there were pics of that and an update as to how that is working out? I would still need to purchase the 8-ft ones and have them cut down. And figure out a way to get them home. The 6-ft ones barely fit into our Leaf. Still I am determined _ I really like the visibility factor and not having to close the door. Wonder if I could find these in dark brown or black? Couldnt have worked better. Thx. Thank you for the inspiration! I don't have a car or drive so I didn't want to carry big shelves on the bus, so instead I bought a screen replacement that was animal proof (meaning, cats won't be able to make holes or dents with their claws if they climb. The screen is made to fit a regular sized door so it fit perfectly in the door to the room where my foster cat is currently staying. I stapled it to the door frame and floor (that's tricky - it's a wood floor so the staples can sometimes not stay and my cat nearly went through), and I used your idea for hooks on the right, so that I could open it to come in and out for feeding. This has worked very well so far, and I thought I'd mention it if anyone else has run out of ideas or if there are climbing issues. Got the screen at Home Depot. Wish I could post a pic! Thanks for this great post! Hi everyone! I have two great cats but one of them persistently meows outside of my bedroom door every morning as soon as the sun rises waking up me, my wife, and any other guests staying in our guest bedroom. Our bedroom doors are attached to the kitchen/dining room space, and there is a doorway but no door between the living room and kitchen/dining room. 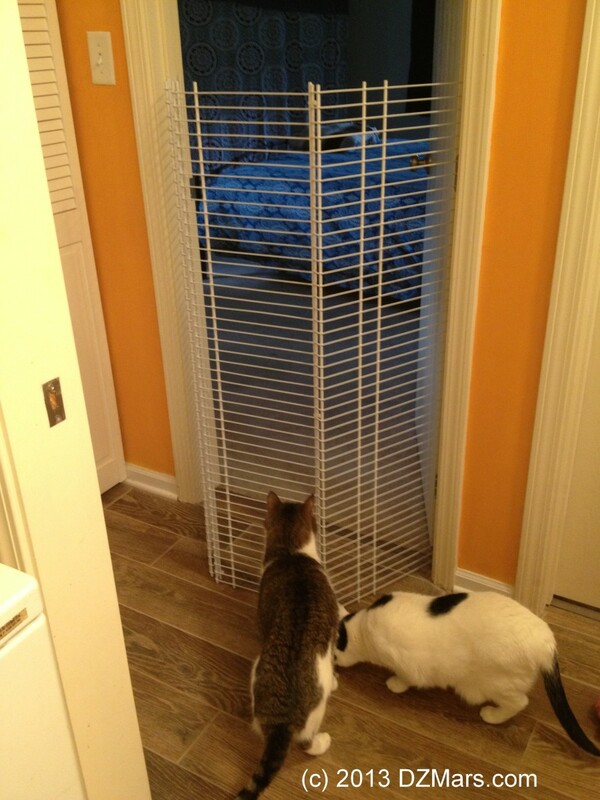 We had considered buying an accordion door to keep the cats in the living room at night but came across this post and decided to give it a try. What a great fix. We got a couple shelves as tall as the door way, zip tied them in the middle and used two clips on either side of the shelves that can be detached during the day. The cats can't climb over and can't knock it down and now we can all sleep in peace while they play in the living room. For those worried about their cats climbing over, I'm wondering if you couldn't take something like paper towel cardboard, cut all the way down horizontal, slide around 4 or 5 of the metal shelving wires, so when the cats tried climbing, the paper towel rolls would roll and not allow the cars to get a foot hold. Put up three, 16" zip-tied 6' panels for our 10 week old kittens. One of the two was over the top in under 10 minutes. Back to the drawing board.... Sigh. This is a GREAT invention! My Dad and I had been searching for a way to separate cats for a long time, unsuccessfully. I tried searching again recently when additional cats showed up which is when I ran across your idea. How simple, relatively inexpensive, and effective! But we did alter the instructions a bit. We used 2 x 16" wide x 6 ft. high shelves. We weren't crazy over using screw eye hardware and drilling holes into the walls or door frame in order to attach them. We both simultaneously came up with using some kind of tension rods to hold them in the doorway. The shelves were situated with the lip sides placed at the edge of the doorway with the two non-lip edges in the center. My dad got small diameter tension curtain rods and extended them through the lip edge of the shelves at both the top and bottom and he thought of using the cable ties to hold the two shelves together in such a way that between that and the curtain rods the two shelves will actually slide past each other which allows them to be used as a door that can be opened and closed. I wish I could add pictures because this verbal description is probably difficult to picture. So far it is working great. I built this cat door and found it was effective but very unwieldy and very difficult to remove and set up easily. I redesigned it, using the three foot ends from the eight foot shelves I originally bought. This door uses the three foot shelves horizontally instead of vertically. I used two 12" and one 16" shelf, tied together using the same plastic cable ties. The shelves are suspended on hooks, using key rings linked on the shelves to go over the hooks. The lower end overlaps the door jamb and is held in place by another key ring-hook system. It works very well and is far easier to put in place and take down than the vertical system described above. We just built our cat proof gate and it is working like a charm! The cats have screamed at it and started to climb it but it wiggles just enough to discourage climbing. We used 12" wide panels that are 72" tall(long). The whole thing was less than $50 including the eye bolts that we used to secure it to the wall and the zip ties. This cat barrier saved 4 cats in a foster situation. Thank you SO much for sharing your genius plans! Thank you for sharing this brilliant idea! There needs to be a product like this on the market. I work from home in a one-bedroom that doubles as an office. My cat has major separation anxiety, strong opinions about when I should wake up, and a tendency to chew things like cords and yoga pants, so I've been having to keep the door shut, which restricts air flow and keeps me up at night. The gate was easy to assemble and works great! I sleep better with the door open and Mavis loves that she can see me when I'm working in my office. Thanks again! You're a lifesaver. A kitten wouldn't be able to climb over it? This looks like a great solution....but it looks like it would be "climb-able"......why can't they just climb up and over? Hopefully its not too late. I'm putting it together right now as a door to separate two cats in a doorless studio that hate each other. I have an arched doorway but no door so this will have to do. THANK YOU! Just found out my cat needs emergency surgery and will need to be in isolation in my office for a week. I've been scrambling to find a barrier that will allow ventilation (and keep her from feeling lonely and isolated), but that i can get in & out of easily because i use my office a lot. Baby gates are such a pain, and i have to use 2 or the other cat will just jump over! Like Amanda last year, I was about to buy two pet/baby gates, stack 'em up, and hope for the best. Then I found your DIY solution ... which appears to be roughly eight thousand times better. Easier to set up, easier to take down, easier to customize. Eager to build it. My body cannot take the incessant 5AM meowing at the door any longer... Thank you much! I added to this recipe by purchasing outdoor screen material and tying it to the shelf pieces using grommets. Worked great to prevent reaching through the gaps with a paw. Did either of your cats exhibit a desire to climb the gate? Thank you SO much! I saw your blog yesterday and built a gate today...you have no idea how much you have helped, we have three cats and have a territorial war going on currently, I built two gates to keep them from marking their territories on our couch and kitchen, I was using tarp and plastic covers earlier and was getting depressed with my house looking so ugly all the time...all the options I checked online were either too expensive or I knew my cats could easily jump over them...this idea is so easy and inexpensive, THANK YOU THANK YOU THANK YOU! I am *so* thankful I found your tutorial! We adopted a rescue cat (thinking he would make a lovely companion for my female) to unfortunately find out that he is not other-cat friendly. I am not willing to give him up yet (it took him so long to get comfortable enough to open up to where he is now. I couldn't imagine sending him to a shelter again and breaking his heart) without exhausting every resource I can to make things workable for my cats. We are expecting #2 any day now and needed to find a way to separate our apartment as he has taken a liking to sleeping in the babe's crib. Using this, I can separate our apartment in half, giving both cats ample space without worrying about my female getting attacked, or the baby being slept on by a super cuddly (but HUGE) cat. Very simple yet clever design. Works amazingly. And way cheaper than anything even remotely comparable. Thanks! This worked great! I was about to buy 2 baby gates and try to stack them, but came across this and it's perfect! It was so fast and easy. Took me 5 minutes to zip tie and have it up. 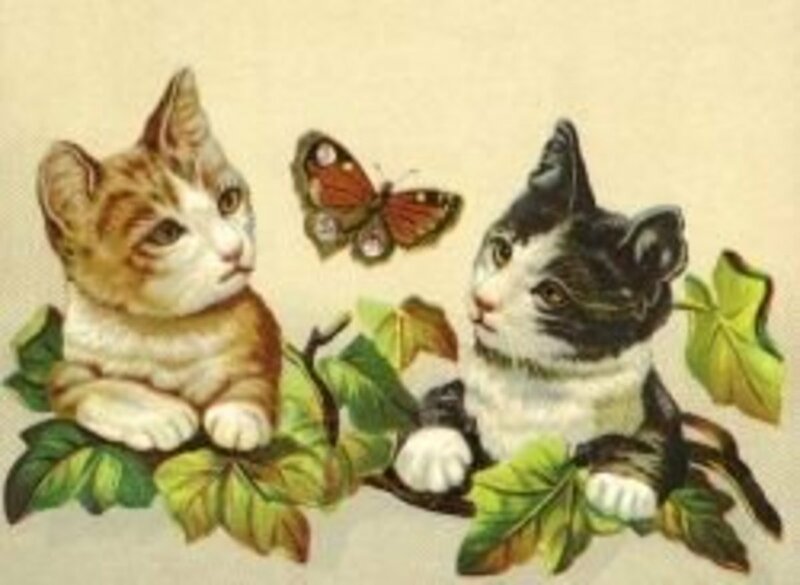 I'm using this to "reintroduce" my two cats- who hate each other. Genius! Just wanted to say that I made one of these today and it works perfectly! Thanks for the suggestion!! Question: how do you get into/out of your bedroom without your cats going into your bedroom? I'm glad it worked for you and thanks for the compliment! Hope it kept your kitten at bay! Thank you for sharing!!!! This is truly brilliant (not an expression I often use), and I am very much looking forward to making several of these (two screen doors that need protection from newer kitten) and my bedroom (same as yours-- windowless, attached to bedroom & closet!). Never underestimate the power of a determined cat, though! I use dumbbells against the gate when I don't want to attach it to the wall and my cats want out. Good luck! Keep that Benadryl handy! Thanks for the great idea! I have a friend coming to visit with a cat and I need to keep her out of the rest of the house (since I'm allergic). This should do the trick! This is a great invention. 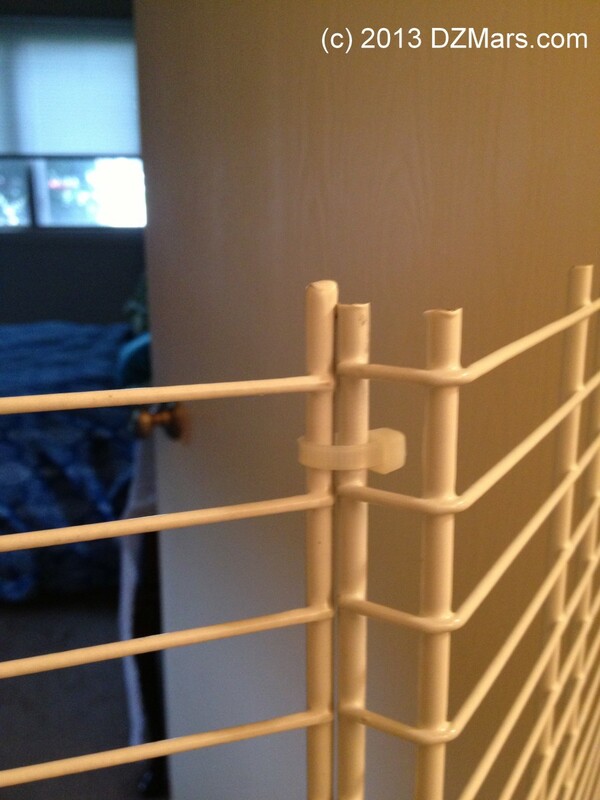 :) I have a bunny and this gate would also work on keeping him from rooms that are forbidden territory. voted up!